I really need to make time to visit more local museums. Yesterday I finally got around to visiting Banbury Museum (i always go to it's shop to buy Banbury cakes when I'm in town but never any further!) It is a lovely little museum that is well worth a visit. It is not that large but has some interesting exhibits on the history of the town and it's industries including a cart (sans horse of course), old printed pamphlets and the corporation mace. A few weeks ago I went to Banbury to walk the Oxford Canal there, however as it was heavy rain that day i went to Haddenham instead. So today, with the weather forecast again not looking too good I returned to Banbury to try again. Luckily this time the rain held off in the morning though recent heavy rain has turned the towpath into a quagmire in places. I did advance further up the canal than I have been before but eventually it got just too muddy! You can see my photos here. There is little that can compare to the glorious sound of a class 37, so two of them is pretty epic. 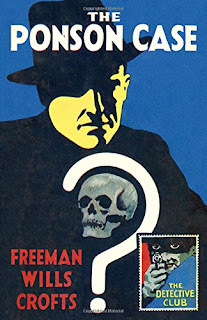 By Freeman Wills Crofts this is a complicated and engaging crime drama first published in 1921 involves the investigation of the apparent suicide - later declared murder - of an old businessman on his estate. There are a number of possible culprits all with motive but also alibis, Inspector Tanner of the Yard is determined to find out the truth. So begins a complicated and meticulous murder investigation. Mostly by the professionals though as its a Golden Age novel there is some amateur sleuthing too - but Tanner leads most of the investigation. It is quite wordy (probably could have done with a bit of an edit to be honest) but the plot is excellent. Part of the Collins's Detective Club, reissued with the original artwork and is very stylish indeed. Today I went to Alvechurch. I have been once before a few years ago but needed to update my imagery of the station, explore more of the actual village (in the end i just went up to the church) and see more of the Worcester & Birmingham Canal that flows through the place. As for the latter I didn't really go any further than I have been before due to the muddy state of the towpath so I need to go again after a few dry weeks! It is a very nice place anyway and not far away, you can see my canal walk photos here. A fascinating article on the Apple's first Disk Operation System (DOS) which it needed for the Apple II microcomputer. As the article describes Apple was forced to buy in a Disk Operating System (DOS) from an outside company to work with the Apple II and the innovative disk drive Steve Wozniak had designed as they didn't have anyone in house who could develop the DOS in time. Apple DOS was critical in the success of the Apple II and hence Apple itself which may not have survived long enough to develop the Lisa and Macintosh if the Apple II had not been the success it was. 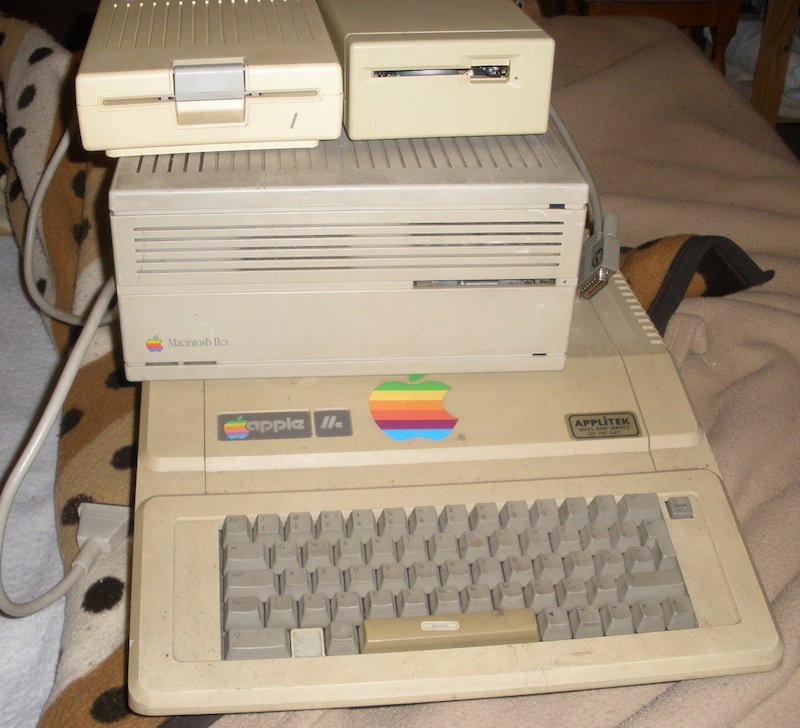 Indeed the Apple II continued to be a success well into the late 1980s. A Chiltern service arrives at Dorridge. The villain is a sinister serial killer who isn't unveiled until late in the story. It is all starts fast paced, exciting... and quite frankly ridiculous. Before long the story starts to drag as start to forget exactly why the characters are racing around the country. Well just imagine some classic chase music while you read it, it helps a lot. The ending is dramatic, the story is worth persevering with. 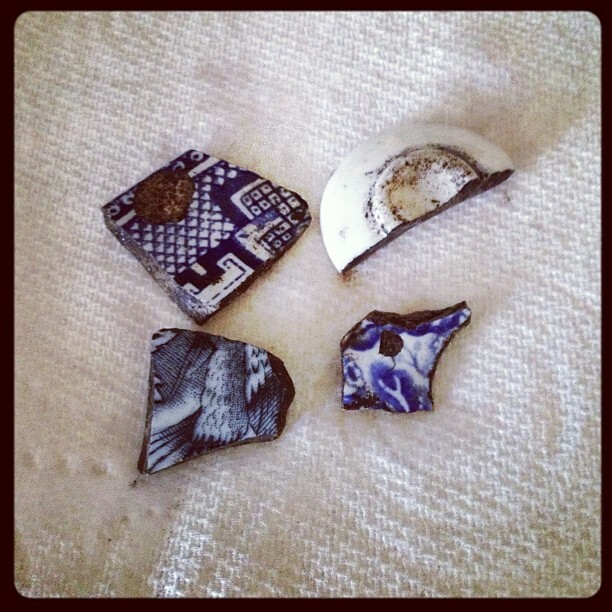 While digging a hole in the garden awhile ago I found a few pieces of broken crockery. Its funny how you always find these little bits of broken cups and plates if you dig deep enough. I wondered why this was so. Did people in the past often drop cups and plates in their gardens and then leave the shards in the garden? I'm not the only person to ponder this, and their thought that maybe these shards were put in the bottom of pots and over time ended up in the soil seems feasible. As well as these pieces of crockery I also found a large rusty metal bolt. Maybe it fell off a Spitfire... well as i live opposite the Castle Bromwich Jaguar factory which in the war made Spitfires perhaps that isn't quite as far fetched as it might seem. Probably more likely off an old lawn mower though! Today I visited my favourite preserved railway the Ecclesbourne Valley Railway for the first time this year. The EVR was holding a Diesel Locomotive Weekend and I was keen to see one of the only two surviving Class 42 "Warship" locomotives which was one of the visitors. Despite the snow and cold I had a good day. The snow photos do look quite dramatic though hopefully when I go to the EVR again in May it will be lovely and sunny and warm! You can see the photos here. Digital Equipment Corporation (or DEC) was at one time one of the largest computer companies in the world, even threatening to overtake IBM at one stage. However like a number of similar companies which made their fortunes from minicomputers they were unable to adapt to the rapid pace of change to personal computing in the late 1980s. DEC was formed in 1957 by a couple of computer engineers, Ken Olsen and Harlan Anderson, with experience of working on computers at MIT Lincoln Laboratory. They wanted to build interactive computers but had trouble getting funding to start their business. Due to the reluctance of investors to commit to funding a computer company (as the fast changing nature of the industry had made making a profit on the new technology rather elusive) the early DEC instead concentrated on building electronic and computing modules for laboratories with the aim of building full computers later on. The name that was chosen, Digital Equipment, also masked the original intention of the company. With the company up and running the first computers came soon enough - though to keep investors from running away scared they did not call them computers, the PDP (Programmable Data Processor) family arrived with the PDP-1 in 1960. The PDP family continued to be developed throughout the following two decades with the 12-bit PDP-8 - the first successful minicomputer, and the 16-bit PDP-11. 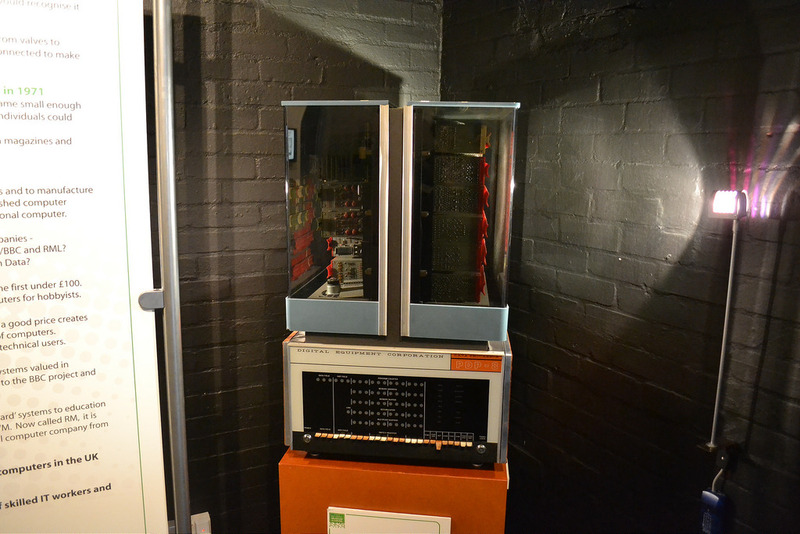 The PDP-11 remained on sale until the 1990s with over six hundred thousand sold. Ironically one of the eventual agents of DEC's demise as we will see later, Unix, was first developed at Bell Labs on a PDP-7 in 1969. DEC's next major family of computers was the 32-bit Virtual Address eXtension (VAX) family of high-end minicomputers which arrived in the late 1970s. The VAX family along with smart terminals like the VT52 and VT100 (DEC soon dominating the terminal market) helped DEC rise to become the second-largest computer company in the world in the mid 1980s. It is probably worth mentioning more about DEC terminals. The first DEC terminals were the VT05 and VT52 which were successful enough but the VT100 in 1978 became the most recognised terminal name in the world and made DEC the leading vendor of terminals. Eventually over six million terminals would be sold by DEC. Along with competitors like Prime Computer and Wang DEC began to falter in the late 1980s with the company's first quarterly loss following on a mere couple of years after the company had reached it's peak. Personal computers and Unix workstations were beginning to appear in ever greater numbers. Companies were quickly moving away from minicomputers in favour of the client server model, workstation performance (especially RISC based systems) was beginning to approach that of the "old iron" like DEC's VAX. However as DEC was a "full spectrum" computer giant with a product range from microprocessors to software surely it could adapt? DEC had dipped their toes in the water with the likes of the Rainbow 100 personal computer in 1982 but these efforts did not set the world on fire and DEC was far too reliant on the fast shrinking minicomputer market. The company was not set up to sell computers cheaply. In 1994 DEC joined the RISC workstation club with it's 64-bit Alpha family of CPUs and workstations. Despite the industry leading speed of the Alpha microprocessor (which had Intel worried for a while) DEC's losses were beginning to mount. Restructures were followed by record losses as the 1990s progressed. Despite layoffs and sell-offs of parts of the business DEC could not be turned around and the company was bought by Compaq, one of the "upstart" PC manufacturers, in 1998. The purchase did not go well for Compaq though who ended up being bought themselves by HP in 2002. Now DEC is long gone though it was survived by Alta Vista, the search engine it created in it's final few years. Alta Vista was eventually bought and absorbed by Yahoo in the early 2000s. The Nursing Home Murder by Ngaio Marsh (with some medical advice from Dr Henry Jellett) has all the makings of a superb read. 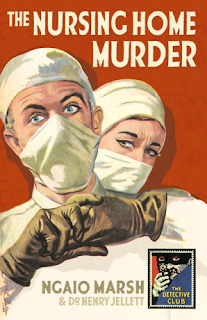 It combines a murder mystery with a medical operating theatre drama and even a bit of politics thrown in! It doesn't quite succeed. It is a good novel though at the end you are thinking it could have been so much more considering the ingredients in the recipe. Unlike many Golden Age novels with their enthusiastic amateur detectives this book features solid police work including under cover and a crime reconstruction. There are a couple of enthusiastic amateurs who Alleyn calls upon for a bit of help, they are pretty annoying but luckily do not dominate proceedings. I headed to Banbury today to do a canal walk, however heavy rain over the last few days (and continuing all day today) put paid to that idea. Instead I just bought some Banbury cakes (which I love) and then I headed off a little further down the line to Haddenham & Thame Parkway. As the station is a "Parkway" I didn't think there would be much around as parkway stations are often built in the middle of nowhere. However I was pleasantly surprised as the Buckinghamshire village of Haddenham is very nice indeed complete with a lovely old church, thatched roof cottages and various other delights that the continuing rain could not ruin. You can see my photos from Haddenham here. I've travelled through Dorridge many times on the train, and also been to nearby Knowle a few times but until today I'd never actually been to the village near Solihull. I took some photos at the station and the local church. It is an affluent area, supposedly a lot of well off Brummies and Midlands types live in Dorridge and the surrounding area though I didn't see anyone I recognised. You can see my photos here. 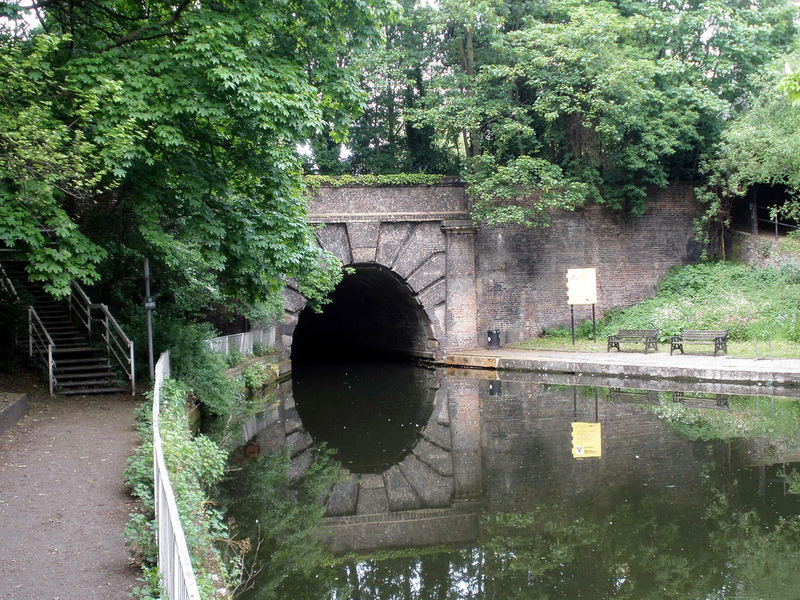 Islington Tunnel is 878m long and takes the Regent's Canal under the Angel area of Islington. The tunnel was opened in 1818 and has no towpath. Before canal barges had their own built-in source of power (either steam or diesel engines) barges had to be legged through the tunnel. This meant that men had to lie on top of the barge and push the barge through the canal with their legs - no doubt quite a tiring job in a 878m long tunnel! Later on a chain on the canal bed was fitted to haul barges through pulled by a steam tug and later diesel. The chain went out of use in the 1930s, by then most barges could get through the tunnel without any help. "Quick Curtain" by Alan Melville is another long-lost Golden Age detective novel republished by the British Library. 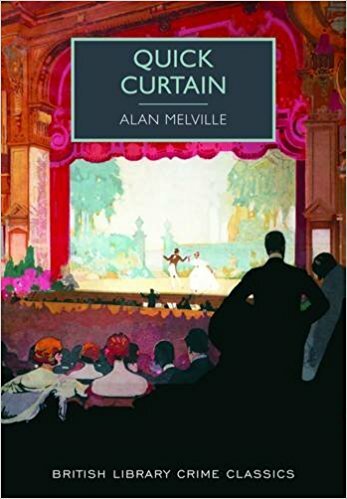 Alan Melville is better known as a broadcaster and playwright but he also wrote a number of novels including crime stories in the 1930s. The theatre is where this book is set, the murder taking place during a performance where the fake bullet in a stage shooting is switched for a real one. Inspector Wilson is set to solve the case with the help of hid adventurous and frequently scolded son. 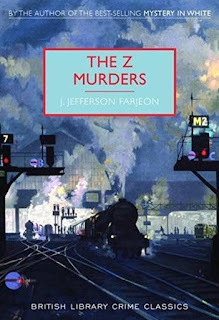 The book is a witty delight, not to be taken too seriously as a crime novel but works much better when you accept this is more a satire on showbusiness. That is not to say the book hasn't got a decent plot and some interesting sleuthing. Credulity is stretched a bit far though but you don't mind because of the enjoyable way the story has been put together. A trying weekend due to the snow and a burst pipe at my Mum's house but luckily I had today off work to go to the dentist and therefore afterwards I was free to go somewhere. I went to Earlswood which straddles the Warwickshire-West Midlands border. The platforms in fact are in Warwickshire but by the time you are on the road outside you are over the border. There isn't a great deal around Earlswood apart from countryside and some rather expensive looking houses. I had a nice walk down a country lane, and kept humming some John Denver to myself for some reason. You can see my photos here. A Class 142 departs Sheffield station.